Peasant clothing was usually made of rough wool or linen spun or woven by the women of the family. Men wore tunics and long stockings or leggings to keep them warm as they worked the fields, while women wore long dresses and chemises as they toiled in the home. During the winter months, peasants made use of simple cloaks, woolen hats, and mittens. We carry authentic peasant apparel to give you the look of a commoner from the medieval era. 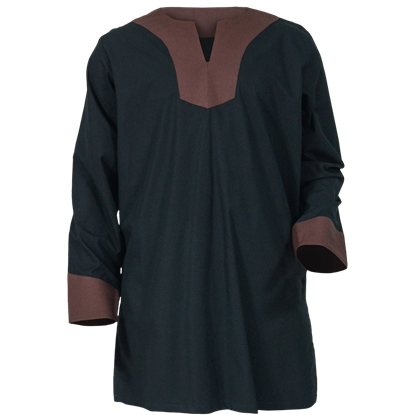 Our inventory includes a wide range of medieval clothing, such as peasant blouses, peasant skirts, medieval shirts, hosen, leather belts, hooded cloaks, linen underdresses, peasant gowns, peasant boots, and more. These pieces come in a range of colors, materials, and sizes, ensuring that everyone can find excellent peasant attire for the Renaissance fair, theatrical productions, LARP events, or costume parties. Our selection of kids peasant clothing is filled with staple pieces that will fit into any little reenactors wardrobe. 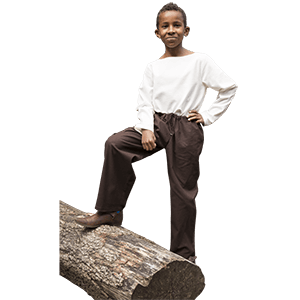 Shop peasant clothing for kids and you will find essential gowns, tunics, shirts, pants, chemises, cloaks, hoods, and more that are perfectly suited for a wide variety of characters. Whether your child is a medieval peasant maiden, squire, rogue, or a unique character of their own imagination, our historical peasant clothing works great. Classic medieval shirts and dresses are ideal for recreating peasant looks as well as forming bases for other kinds of outfits. Even if your young one wants to dress up as nobility or even royalty, our peasant clothing section is a great way to start any reenactment, historical, or fantasy outfit. Not everyone in the Middle Ages was royalty. Most people were peasants. But that does not mean their roles were not important. As peasants made up a massive part of medieval society, their livelihoods and character types were quite diverse. We carry a wide range of styles here in our mens peasant clothing section, and much of it is versatile enough to work for most any look. 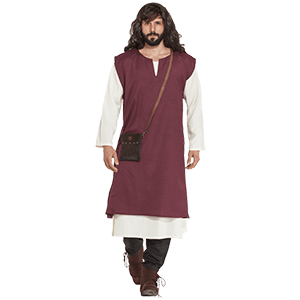 Shop peasant tunics, lace-up shirts, canvas peasant jerkins, and mens peasant pants here that can help form the base of an incredible range of medieval, Renaissance, or even fantasy looks. Shop here for all our mens historical clothing fit for medieval peasants. Peasants made up most of medieval society, so their livelihoods and styles of dress were quite varied. We offer an incredible variety of womens peasant clothing here, and much of it works phenomenally well for any sort of medieval, Renaissance, or fantasy look. Get the full look of a medieval peasant maiden with a medieval chemise, canvas peasant gown, and a lace-up medieval bodice. Put together your own unique outfit with our peasant blouses and skirts. Then add an extra layer of coverage or warmth with a medieval peasant cloak, an essential item in any wardrobe. Whether you are going for an authentic peasant look or new essentials to bulk up your reenactment, Renaissance fair, theatrical, or LARP wardrobe, you are sure to find the proper clothing piece here. Every wardrobe needs a good tunic, and the Long Sleeve Tunic is just right for an incredible variety of looks. 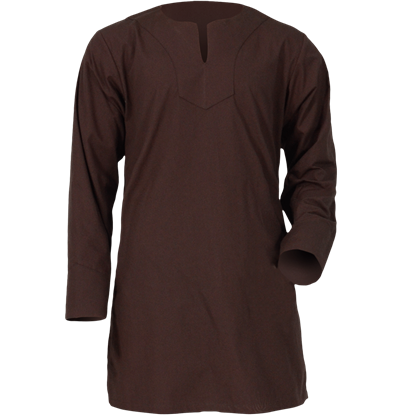 This mens medieval tunic is made of a comfortable, lightweight cotton and comes in a range of colors to suit any style. The Medieval Tunic is a fantastic staple for any historical or fantasy wardrobe. Versatile and comfortable with just the right amount of style, this lightweight cotton tunic is the perfect base for your next medieval or Viking look. This cute cotton Mob Cap Bonnet has elastic around the brim for a great fit on any head. Adorned with lace trim and a black bow, this style of casual headwear was worn by girls and ladies in Regency, Colonial, and Frontier eras. Remarkably versatile, the Simple Medieval Tunic can be the foundation of quite a variety of historical outfits. 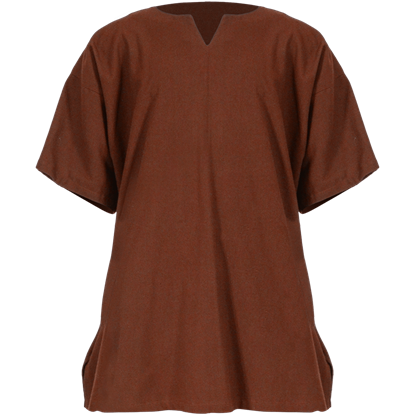 Great for Vikings, medieval adventurers, and more, you cannot go wrong with this short sleeve, natural cotton tunic.